On the spinning front, I’ve started working with silk noil. We received three different types in our silk packs. I liked the grade A mulberry noil best, and so decided to work with it first. There are quite a few possibilities of what I can do with my silk noil. 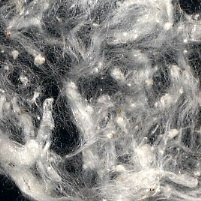 Some I want to dye, some I plan to blend, and I would also like to try my hand at silk fusion paper making. But the mulberry noil I decided to spin on its own. 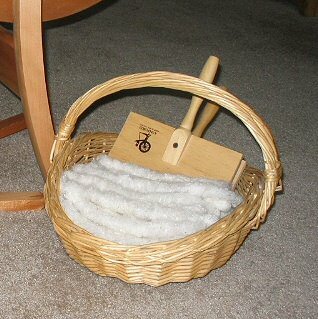 The ½ to 1 inch fibers were easily and quickly carded into rolags on my cotton hand carders. I spun it long draw with lots of twist. You can see from my control card how textured it is. I’m not sure how well I like those little pieces of cocoon and whatnot in the yarn. I picked the biggest ones out, but there were too many to get them all. * Dealing with all the noily bits took a little getting used to. 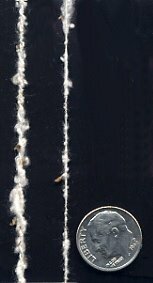 The fiber alone tends to spin out sewing thread fine, while the noils create relatively giant slubs. I had to take care during spinning to maintain the integrity of the yarn. * Treadling and drafting speed. I had to experiment a bit with this and finally settled on a fairly slow speed to both treadle and draft. This enable me to get the twist I needed but still control the noily parts of the fiber. * Too much whiteness! I wanted to spin it as-is since I’ve never worked with silk noil before, but my eyes really long for color in the process. 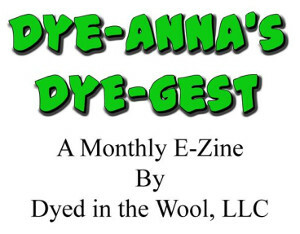 I will dye some next and so spin it with some color. Nice yarn. I was wondering how it would spin up with all of the littel "extra" bits in it.